Warren Buffett is all set to pull in $12 billion in profits on a single deal with Bank of America. Buffett invested $5 billion in Bank of America in 2011. That move came at a critical time for Bank of America with the company trying to leave behind the financial crisis with its new CEO Brian Moynihan. Buffett negotiated a favorable deal with the bank, due to his investment acting as a public vote of confidence in the company's future. His $5 billion investment in preferred shares came with the option to convert those to common stock shares until 2021. The preferred shares paid $300 million annually in dividends. Buffett's common stock shares are currently worth about $17 billion, $12 billion more than the purchase price. 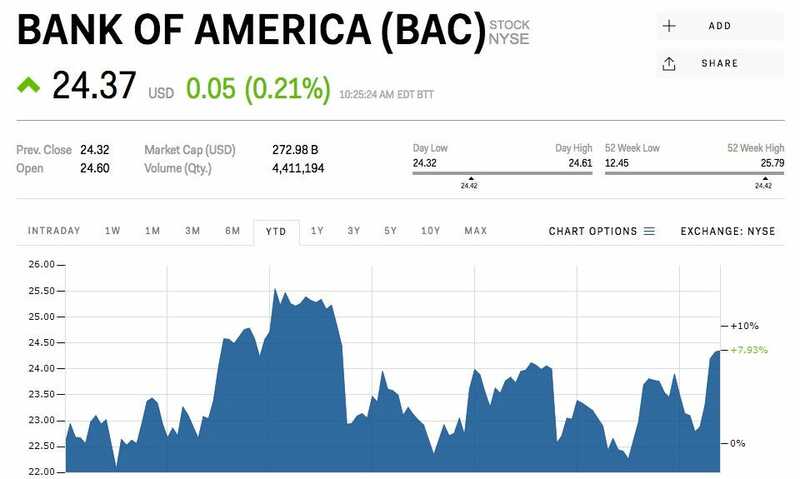 After passing a stress test on Wednesday, Bank of America's plan to pass along its wealth to its shareholders in the form of dividends and stock buybacks was approved. The company increased its dividend payments to 12 cents a share, which will return $336 million a year to Buffett after converting his shares to common stock, according to data from Bloomberg. The move makes Buffett the largest shareholder in two of the world's largest banks, Bank of America and Wells Fargo. Bank of America is up 7.93% this year and currently trades at $24.36. Buffett bought his shares for around $7.14 in 2011.